Words of comfort from God as He prepared to deliver the people of Judah from captivity and restore and renew their hearts. Jeremiah served God faithfully for over 40 years. He passionately urged the people to stand against sin and idolatry and reunite with Christ. But the people refused to listen to him. Their blatant disregard and disobedience to God was disastrous. Yet despite their choices, Jeremiah continued to move forward in faith and courage, sharing God’s message. As humans we will make mistakes, but as Christians we have the chance, every moment of every day, to correct those mistakes and live justly through our faith in God. And like Jeremiah, we too must continue to move forward in faith and courage so we can have all that God wants for us. In my younger years I made decisions on several occasions to go after something that I hadn't really thought through. I had plans all mapped out and prayed about each one of those decisions. I asked God to bless the plans because I thought they were the best thing for me. After all, I should know best, right? Hardly. What I should have been praying for each time I made one of those random plans, was God’s perfect will and direction, not mine. 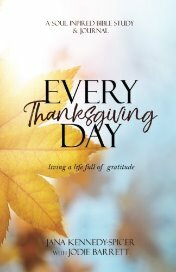 If I had, then I might not have gotten caught up in ‘what I wanted.’ I am forever grateful that He snatched me right out of the trouble spots before I could get in over my head. And I learned the hard way that God’s perspective and plans for me were so much better than anything I could dream up. Each time I went off on my own caused me pain, disappointment, and strife. Turning back to Him was the only way I could have true peace and contentment. God didn't have to beg me to come back to Him. I came willingly, with humility and love for my Father. Often times our poor decisions stem from pride and selfishness. We allow ourselves to become separated from the Most High, believing mistruths along the way that cause further division between light and darkness. But we are ‘Daughters of the King,’ and we have the opportunity to seek redemption. The beauty of a relationship with Christ is that when we mess up, and we often do, we can go to Him and ask for another chance. Humbly bowing before God and confessing our sins is at the heart of our relationship with Him. He longs for us to seek Him, and to ask for healing and restoration by His hands. None of us wants to experience the kind of brokenness and defeat that the people of Judah suffered through, but it is through our own bouts of brokenness and defeat that our relationship with God is strengthened and our faith exponentially tested. It is our privilege to call on Him by name, lay our prayers before Him, and ask for forgiveness. God’s message is very clear in Jeremiah 30. Restoration and renewal would take place for His people. He would reverse their ruins, rebuild their city, restore their fortunes, and renew relationships. What a blessing it is to know that God lives in our hearts even through the difficult times and He redeems us time and time again. God instructed Jeremiah to write down this message of hope so that it would be recorded for all time. His message revealed promises and assurance that the people would be returned to the land first given to their forefathers. He promised them that He would bring them back from captivity and replace their pain and suffering with calm and peace. God’s people would be merry and they would be large in number. They would be strong and not weak. His people would have new life and their hearts would be refreshed. There will be difficult times ahead, but as believers we are reminded that following Him and serving Him allows us to have a deep, abiding relationship with Him. The feelings of oppression, darkness, and defeat had surrounded God’s people. And what had once seemed like irreparable trauma or hurt was reversed and healed by the Holy One Himself. 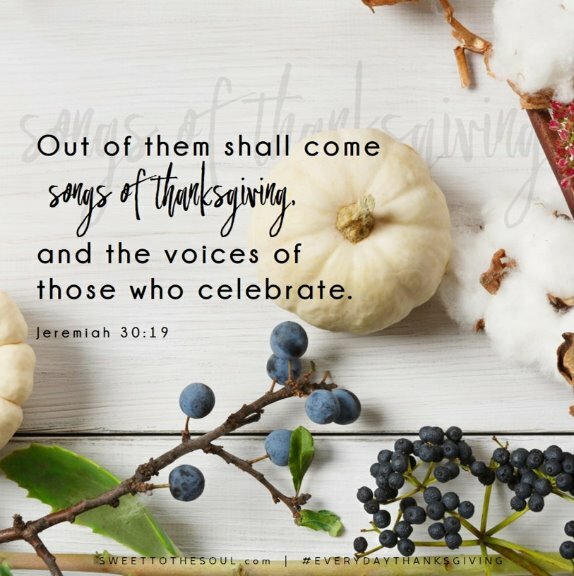 Imagine the thanksgiving and praise, and songs of rejoicing that took place on the heels of the oppression and slavery. God did not forget His people then and He won’t forget us now. Each time He gives us a new beginning it is filled with hope and a future beyond what we can comprehend. He prepares us for a life greater than we could imagine, with Him at the center. 'I will give them a heart to know Me, for I am the LORD; and they will be My people, and I will be their God, for they will return to Me with their whole heart. Jeremiah 24:7 (NIV). 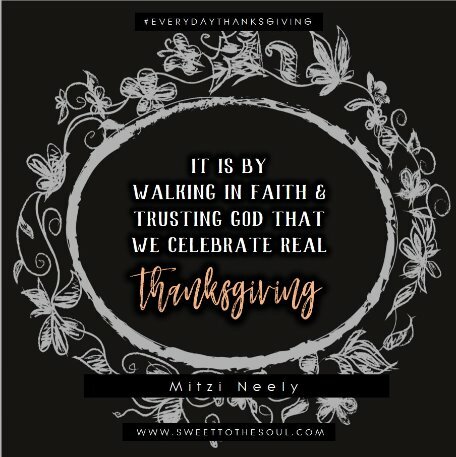 It is by walking in faith and trusting Him that we celebrate real thanksgiving. It is because of His unconditional love that we can survive the most difficult times and be made new. It is through our gratitude that we honor Him. Loved this! The Old Testament is so rich and you brought it alive for me afresh and anew today.